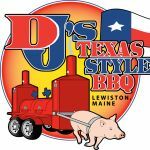 Since some of you folks are asking after Bar"G" gave such a great review to My UDS Brisket I decided to post it here for all to enjoy! This is more of a method than an actual recipe. Trim a packer Brisket and rub heavily with K- salt, Black pepper(table grind),and Mexican Oregano. Wrap in plastic wrap and store over night in the icebox. Prepare your charcoal basket and add 3-4 chunks of Mesquite. Bring the UDS up to temp set to run at 230 deg. Place on the UDS fat cap down and smoke 2 hrs. Flip the brisket fat cap up for 2 hrs. Remove the Brisket from the UDS and Place it in a Foil Pan fat cap up insert your temp probe and return to the UDS. Cook to an internal temp of 195 deg ,do a poke test if it passes pull it. Other wise check it every 5 deg temp increase till it passes. Remove from the UDS foil over the pan allow to rest for 1 hr. on the counter. After the rest remove to cutting board, separate the point from the flat. I chunk up the the point and add Bull Dust. Drain the juices from the pan to a defating cup. Place the cubed point back in the pan and back onto the UDS for Burnt ends. Slice the Flat, add the pan juices back to the slices. That is the best BBq sauce in the world for a brisket. Enjoy!! This Injection adds moisture,and is a flavor enhancer it adds beefiness to the brisket . Dissolve the aus jus with the coffee add the Worcestershire and the Bull dust. Heat over med heat 1 min remove from eat and allow to cool to room temp. Inject about every 1" and go directly to the smoker. Smoke it as you normally do. Add all together. Mix well. Thanks going to give it a try. Thanks Dawg, good information is always appreciated! Can you make your bovine nectar up the day before or will the coffee start tasting bad? I keep a jar in the fridge all the time The way I see it it improves like a fine wine, the night before is no problem. Just set it out an hr before you are ready to use it so you can shake it up good and remix the oil before injecting. Okay BluDawg... I am going to give this a try on my UDS. My mouth is drooling like crazy!! I am going to try this out for myself. If I dont fish both days this weekend I am going to give this a whirl. That's some mightyfine brisket BD. Will put your process on my list. 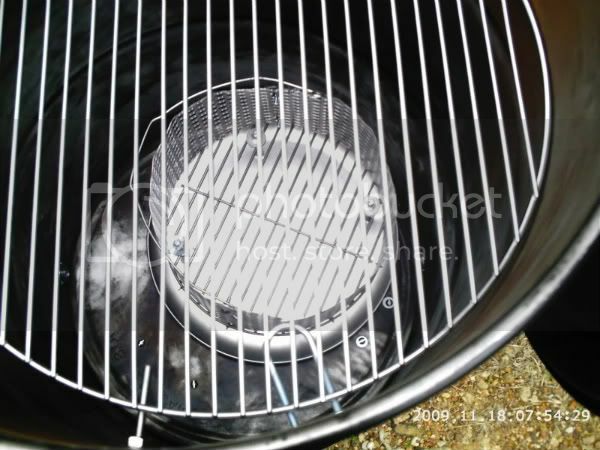 Do you have some sort of diverter in your UDS or is the heat direct on the brisket? As you can tell I aint BluDawg but I do mine without benefit of a diverter. Cooking brisket over direct coals give a whole new flavor profile IMO. 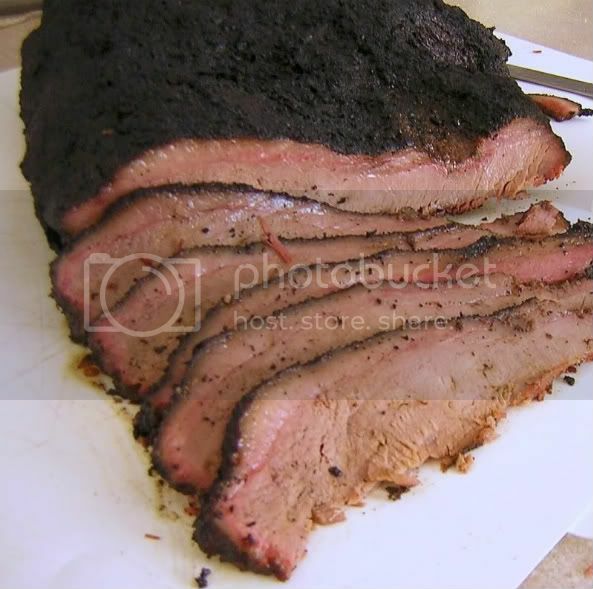 I like cooking and eating indirect smoked brisket but for just plain ole sit down good eating brisket I prefer direct cooked. Reminds me of when I was a kid and my dad and uncles use to cook on them old throw together cinder block pits. No EH meat is right over the fire Old School, as "G" said just like my Pappy, Dad & Uncles used to cook when I was a pup. I did your method to a T yesterday. The Wife, Brother In law, Sister In law and two neices loved it. They all gave it a thumbs up. Thank you for posting it.